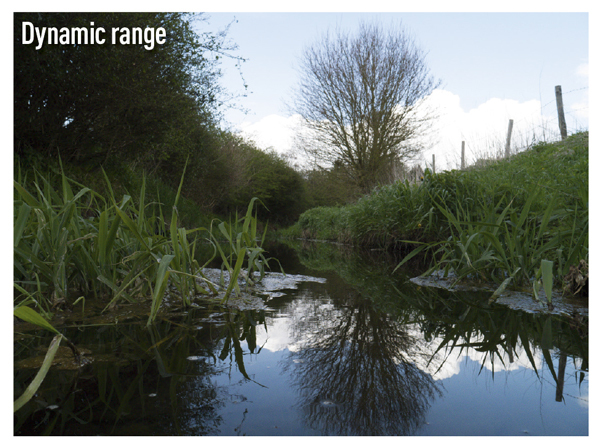 Featuring the same sensor as the Panasonic Lumix DMC-GX1, the Lumix DMC-GF6 has a similar dynamic range, which is approaching a rather modest 11EV. Indeed, when shooting in a standard mode without iDynamic or HDR settings applied, the camera struggled to capture a wide range of tones. This was most notable with overcast scenes where the sky was bright white and the landscape dark. In this situation, the sky could appear as a solid white mass (highlight clipping). Systems with a dynamic range closer to 13EV would show some detail. Applying iDynamic (auto is fine) made some highlight and shadow detail more obvious, and after shooting for a day and then reviewing my images, I opted to keep the iDynamic activated to gain that little extra tonal detail. Of course, HDR mode extends the dynamic range greatly and this now has its own place in the main menu. It’s available when shooting in JPEG format only and does not offer manual control over its strength. Essentially, it records three consecutive frames and blends them for a wider tonal range. Even though the camera can be heard recording the three frames one after the other, it blends the images together very well and for the most part a tripod is not necessary to achieve crisp results. As the sensitivity rised, the dynamic range is further compromised, so don’t expect punchy, exciting images when using ISO 800 or above.